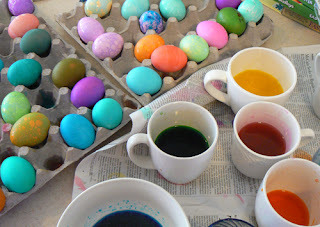 We dyed about eight dozen eggs with Uncle Jon, Aunt Ashley and Grandma & Grandpa Kewish. We are now awash in eggs, but it was really fun. 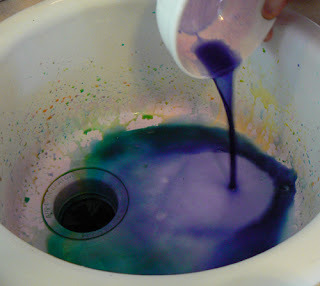 This is an old Kewish family tradition from our childhood that we call “oooh, aaah.” Basically we all stand around and pour the colors down the drain while saying, “oooooooh, aaaaaaah.” It doesn’t take much to entertain us, plus little kids really love it and as an adult you feel justified in doing something a bit silly. Here’s a good shot of Nezzie mid-aaah. One of my favorite techniques from good ol’ Martha Stewart, where you use dye and oil to get this marbled effect. Do those eggs ever dry or do they stay a little greasy from the oil? Very pretty. when you take them out, you wipe them off with a paper towel. this one’s fresh, which is why it looks a little greasy. 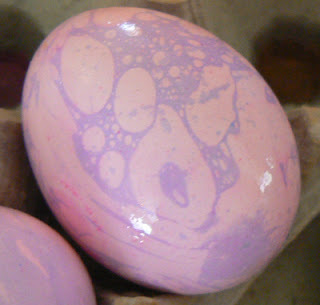 I tried my own Martha Stewart experiment this year with silk ties and Easter eggs – ummm… I think I’ll try the oil next year. Those are cool! 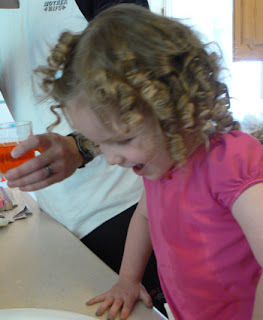 Those ringlets on Nezzie are DARLING! How fun! We did our own ooohhs and ahhhhs! haha. Graigg does not understand why I boiled 3 dozen eggs when there are exactly 2 of us in the house that eats HD eggs. He just doesn’t understand. haha. Graigg and Dad. He thought we had too many. He’s crazy, eight dozen is BARELY enough.